Ten-Year Veteran	 Efficient and adequately powerful, but unpleasantly noisy. Ten-Year Veteran	 Front fender undulates into a strong character line. Ten-Year Veteran	 Elegant lines at home downtown. Ten-Year Veteran	 Side view is the Sentra's best angle. Ten-Year Veteran	 SL's 17-inch wheels and wavy character line reduce the visual bulk of the tall body side. Ten-Year Veteran	 Protruding tail lamps add a muffin top effect to an overly rectangular rear. Ten-Year Veteran	 Appearance of traditional luxury. 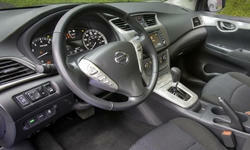 Ten-Year Veteran	 Nissan says the shape of the instrument panel was inspired by a bird's wing. Ten-Year Veteran	 Classy, traditional gauges and logical controls. Ten-Year Veteran	 Good materials, but the textures don't always match. Ten-Year Veteran	 Nav screen very easy to read, and only adds $650 (with a rearview monitor). Ten-Year Veteran	 Front seats are too flat and firm. 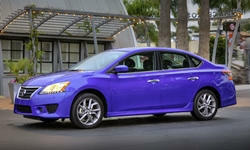 Those in the larger Altima are far better. Ten-Year Veteran	 Plenty of legroom in the back. The cushion is a little low, but this is common even in larger cars. Ten-Year Veteran	 Among the most spacious trunks in the segment (the others are in the Cruze and Jetta). Ten-Year Veteran	 Tall with a big chrome grille.